I first met Eli Rosen this summer at Yiddish-Hoyz in the Bronx, where a bunch of Yiddishists and Yiddish students were having a get-together. It quickly came out that both of us were OTD 1 1 “Off the derech,” meaning ex-Orthodox or ex-Hasidic and involved with secular Yiddish spaces in one way or another. After we established some of our mutual acquaintances (his brother’s brother-in-law was the Rabbi of my family’s shul), Eli told me that he was working on and acting in a Yiddish translation of Eugene Ionesco’s Rhinoceros together with New Yiddish Rep. At the time, Eli emphasized the importance of performing both Jewish and non-Jewish productions in Yiddish. 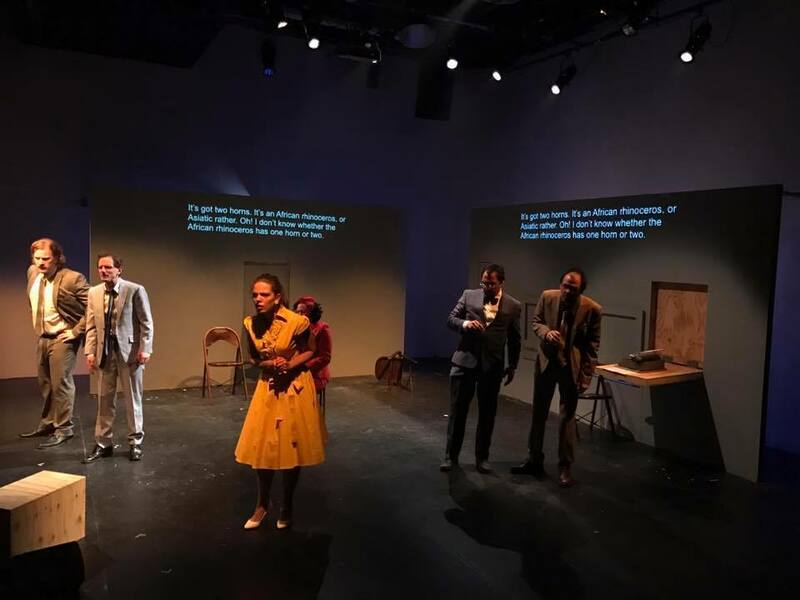 Rhinoceros—which the French-Romanian playwright published in 1959 to address European fascism—feels particularly adaptable, not only to Yiddish but to the present. In fact, the New Yiddish Rep decided to stage Rhinoceros shortly after Donald Trump was elected in November. 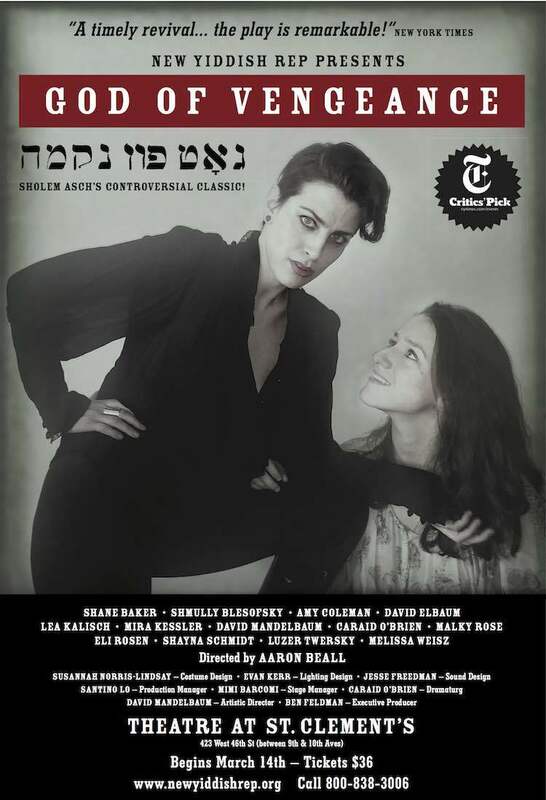 A week before the play’s opening, Eli and I got together to discuss this exciting venture: contemporary Yiddish theater that incorporates universal themes with an eye towards a general audience. 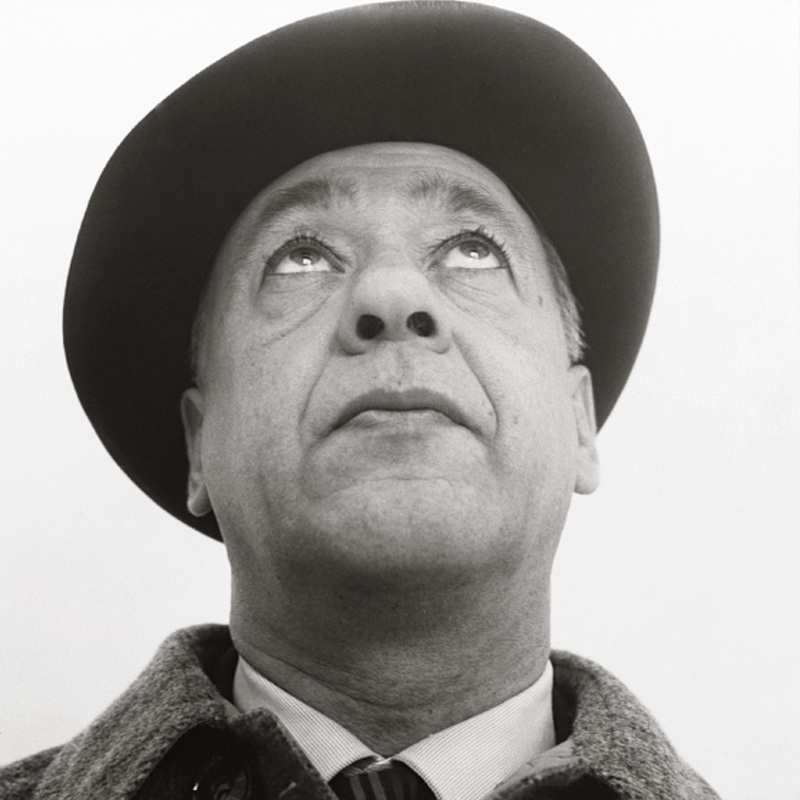 And yet, at the same time, any play—even a French absurdist one—will inevitably take on a new shape when translated into another language, which Rhinoceros, or Nozhorn, most certainly did. Here we talk about Yiddish translation, technical Talmudic terminology, how Eli’s Hasidic background influenced his translation, and why Yiddish can be so well-suited for the existential and the absurd. You started translating Rhinoceros around the same time The New Yiddish Rep was staging Got fun Nekome [God of Vengeance]. Did Got fun Nekome inform your translation of Rhinoceros at all? Yeah, I did the bulk of the [translation] work on the train to and from rehearsal and the performance of God of Vengeance. So there are some homages to Sholem Asch and Got Fun Nekome in Nozhorn. There are some lines that are paraphrased and some lines that are lifted wholesale—because it was just the perfect line and the perfect place. There’s one iconic—at least to me iconic—line in Got Fun Nekome that is somewhat ironic in Got Fun Nekome, even though it’s spoken sincerely. And in Nozhorn it’s a laugh line. The line, spoken by R’ Eli, is “efsher take zey shiken di refue far di make.” And my understanding is on a literal level there are two possible interpretations of that line. One is that [God] sends the remedy for the sickness, and the second more interesting interpretation is that [God] sends the remedy before the sickness. Since “far” in Yiddish can mean both “for” and “before.” But that line is most likely based on a midrash [exegesis] in Chazal that says God created the remedies before he created the sicknesses to ensure that when disease proliferates the cures are already at hand. So in the context of Got Fun Nekome the only way I could understand the second translation is if R’ Eli is designating himself as the cure for all the problems of the world—which he in fact does, he is in his mind the fixer. He was already in place to handle the problem as the problem arose—and thus God has sent the remedy before the disease. So it is a serious line, but it’s also comical in the sense that R’ Eli has this bravado that he can fix absolutely anything. In Rhinoceros—well, I don’t want to completely spoil it—but [the line is included in] a conversation with Berenger, Jean has a conversation with Berenger about Doctors. It’s also a very timely and relevant [line] given that there’s a predictable overlap between people who support the kind of behavior that the play lampoons—fascist, unthinking herd behavior and people who distrust doctors. So the line is kind of spoken in a similar ironic tone. I think I’m correct in assuming that most of the actors are ex-Orthodox or ex-Hasidic, who are fluent Yiddish speakers that grew up speaking Yiddish, or are at least comfortable in the language. You are fluent in Yiddish—grew up speaking it, went to Yeshiva, studied Yiddish. And I think even if some of the actors weren’t born speaking Yiddish, they’ve learned and studied the language. Most of the actors are—well, I have to do a headcount to make that bold a claim. Let’s see. There’s me, Luzer [Twersky], Lazer [Burko], Malky [Goldman], Gera [Sandler], Chezky [Israeli], Mira [Kessler] and Melissa [Weisz] … Yes, most certainly. Most of the actors are either ex-Hasidic or otherwise fluent in Yiddish. How do you think that knowledge of Yiddish or comfort in the Yiddish language affects the performance? Did the other actors play a role in editing or helping with the translation? To begin with, it’s a play that can only be effective with fluent speakers, certainly for the lead roles. That’s because—well with theater in general the lines spoken by the characters are just that, and are not nearly as important as the intention of the characters. In a simple period drama or even a complex period drama like “Got fun nekome” you can, for the most part, take the lines at face value and speak them at face value. But [for] a complex, absurdist, existential drama, [a] comedy or tragicomedy like Rhinoceros, you have to know what you’re saying in order to disregard what you’re saying. There are also so many layers of meaning and possible interpretations for every line. But beyond all that it’s an incredibly musical play, there are repeating motifs, and comically there are a lot of conversations that happen simultaneously. In order for those [comic and rhythmic parts] to really work, [you need] the proper timing and the correct stress of every syllable and the correct joining of words between clauses and so on—the kind of things that only come from native fluency or just fluency. So that is absolutely critical. I would say the play was written in three phases. The first phase was just translation of the text. The second phase involved reading the text around the table and coming up with ad-hoc improvements, phonetic improvements and so on. Was everyone was involved in that? Either passively or actively. Passively they would say something and it would sound wrong to me and I would come up with a better phrasing of it, or as happened in many cases our director Moshe Yassur would say, you know, this may be the correct translation but it doesn’t have the theatricality that I’m looking for, and [he] would either suggest an alternative himself or I would come up with an alternative that was more theatrical, more phonetic, more punchy. And then finally the third phase was the course of actually blocking and rehearsing the play onstage with the physical movements. [With that] you get a whole new understanding of the text and that in turn informs a new approach to translating the text. Can you talk about choosing a play with more universal themes to translate for Yiddish theater and—at the same time—how these themes of (literal and metaphorical!) herd mentality might relate to contemporary Jewish life more broadly, and religious Jewish life specifically? I’m also thinking about how in Hebrew there’s the word התקרנפות 2 2 Rhinoceroization, or the phenomenon of nationalistic fervor , which comes out of this play directly. Well first we need to find the Yiddish analogue for התקרנפות. It would have to be “nozhornigung” or “nozhornishung” … neither of them sound terrific. I think that [the universal themes] speak to the mission of New Yiddish Rep, and our artistic director David Mandelbaum. And that’s that Yiddish theater is for everyone: it’s not just for Jews, it’s not just for Yiddish speakers, it’s for everyone. So we try to stage plays with an eye towards that mission, towards universality. And not just universality, but also plays that are particularly conducive to being translated into and performed in Yiddish, where the Yiddish adds a certain element to the play. That can come about in a number of different ways: It can come from the experience of the actors, it can come from a national Yiddish psyche, or it can come just from the language itself, which of course is informed by the other two things. But I think in this case it works on every level. Obviously, because on the most basic level the play is about fascism, and who better to speak about fascism? And what better language to express those ideas in? Secondly, much like Waiting for Godot—and this is why Godot works so well in Yiddish—it seems as though Yiddish is a language of existentialism, it is the language of waiting, the language of existing and questioning one’s existence. And a lot of Rhinoceros is about that. A lot of it is Berenger exploring his own existence. And finally there are just so many great farce and tragicomic moments that work so well in Yiddish. What do you think Yiddish translation uniquely adds that isn’t there in the original? Do you think Nozhorn is “fartaytsht un farbesert” [translated and improved]? Well one of the reasons Rhinoceros is so particularly suited for Yiddish is because of its musicality. Some of the characters change when translated into Yiddish, most notably the Logician, who kind of represents the archetype of the academic in the ivory tower. [The logician] is above the reality on the ground and oblivious to the reality on the ground and elevates empty sophistry—coming from the background [of ex-Orthodoxy that] we come from, this Logician becomes the Talmudist. Right, and the character is so funny in Yiddish because we have this stereotype of these Rabbis who make absurd logic jumps like the Logician does. Exactly, and that character is just so “fartaytsht un farbesert” in that context. I think one of the reasons the character of the Logician translates so beautifully into a Talmud scholar or a Rabbi is because the Yiddish you’ve used in your translation is heavily inflected with Aramaic, loshn-koydesh, and different Halachic or Talmudic terms. This obviously has to do with your Hasidic background, but a lot of the time it felt like a deliberate choice. Instances where you could have used a word with Germanic origins you chose a loshn-koydesh or Halachic term instead. Of course they’re all Yiddish words but the ones you choose give it a distinctly Rabbinic flavor. Were these deliberate choices? Do you feel you stayed faithful to the original? From French to English to Yiddish. Yeah. So in terms of the English translation I used the one that everyone uses, Derek Prouse. I used that as kind of a jumping off point but I realized fairly quickly, very early on that there were some kind of interesting choices made there, that either didn’t work in Yiddish or in my mind didn’t even work in English. I don’t know if it’s because of the period it was written in—it was done shortly after the play was written, in 1960. I’ll give an example: There’s a line there, I believe it’s Botard In Scene I of Act II where he [the character] speaks about racism. In the English translation he refers to it as “the color bar.” That was a real head scratcher for me. I googled it, could find no real reference to that as a phrase. I wasn’t even sure if color bar referred to a certain kind of color meter or gauge that was a literal bar, like a swatch of color or bar as in barrier, that’s how foreign that phrase was to me. And sure enough I checked the French and it says “le racisme” which means racism, or in Yiddish “reysizm.” So that was a no-brainer. Anyways once I noticed that about the [English] translation I decided to—whenever possible—try and be more faithful to the original [French]. Another example: certain repetitions in the original, especially with Jean’s character but other characters as well—for some reason the translator thought that those repetitions just didn’t work in English and he would change it. Obviously repetition works very well in Yiddish so I’d put those repetitions back in as well. Who perpetuate that kind of mentality? Who perpetuate that, exactly. But also the context in which it’s used [in Rhinoceros] it’s more comical so it kind of serves both purposes: it serves the purpose of the actual message but also the entertainment purpose of the play. [Laughs] To the Yiddish scene? To the contemporary Yiddish scene. And, in some respect to kind of create my own niche within that world. But a lot of those loshn-koydesh and Talmudic terms are more theatrical and more phonetic anyways. So it would have been an easy choice to use them even without the religious and cultural baggage I bring to my translation. There’s one point in your translation where [the two lead characters] Jean and Berenger are talking and Jean calls him my “tayere yid.” It’s faithful to the original because in Yiddish when you say “tayere yid,” you’re just saying “my dear man,” or “my fellow man.” But it has such a different flavor since the phrase literally means “my fellow Jew.” And then in that same paragraph Jean tells his friend he needs the “rotsn” [will] to acquire culture. These words make it feel like the two of them are having a “farbrengen” [Hasidic gathering], like these two yidn in France are getting together over mashke [alcohol] talking about Hasidus. Yes, exactly, “malbushim”—because it has that extra layer of meaning—it’s not just clothes, it’s your humanity. I did that wherever I could. So do you think the play became … Jewish? I think that in so many ways to say that something is Jewish is to say that something is human. Of course. But is it Jewish human. [Laughs] Well of course. Of course. And ultimately we’re all Jews. Right. So in your translation this is called a “gezeyras shavah,” which is, for those who don’t know, a hermeneutical device where you take one meaning of a term to illuminate the same term in another context. And in Masekhtes Niddah 3 3 Talmud tractate dealing with menstrual impurity it says “Eyn adam dan gezeyras shavah meatzmu.” 4 4 Niddah, 19b Which means that no man can determine for himself whether or not something is or isn’t a gezeyras shavah. So I want to know: from where do you derive the authority to use the term “gezeyras shavah” in your translation? That’s an excellent question. I have to say that I expected the question [about the translation]; the “Eyn adam dan gezeyras” I did not expect. The answer to both is pretty much the same: It’s tongue in cheek, there really is no Talmudic equivalent to a syllogism. I was looking for the Talmudic equivalent for obvious reasons. Now, the idea of a “hekesh” would be more appropriate [because] “hekesh” simply means “comparison,” to compare one verse to another verse or one situation to another situation. The “gezeyras shavah” refers to the Masoretic device that enables you to do that [kind of comparison]—the Mesorah [Oral tradition] that says these two words should be compared. So “hekesh” would be more appropriate strictly speaking. Obviously [the term “hekesh”] just doesn’t have the same weight. But I do it in the same way the Logician commits a logical fallacy [in the play] and it’s the kind of logical fallacy that every school-aged child knows is a logical fallacy even if they might not be able to express why—a beginner’s logical fallacy. So a syllogism is not a gezeyras shavah, but the effect is the same. The fallacious syllogism is a syllogism much in the same way this is a “gezeyras shavah.” But yes, I’m very cognizant of the fact that it’s a borrowed term, and it was done so intentionally because it’s funnier that way, and more ridiculous that way. It’s pretty much an exaggeration of the Logician’s character. And part of it is out of necessity because there’s no analogue. 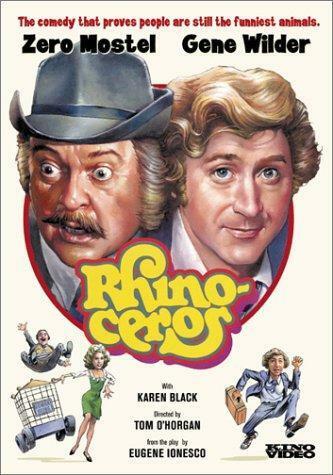 The film version of Rhinoceros starred Zero Mostel, known for originating the role of Tevye in Fiddler On the Roof on Broadway, and Gene Wilder. I think that’s the moment the Logician really turns into a Talmudist. Yes, it is and again, it speaks to a certain theme; it’s just a particularization of a very generic and universal theme that permeates the entire play. Which is: you can present anti-logic and dress it up as logic or anti-fact and dress it up as fact. And if you do it with that aura of authority then all it takes is for one person to agree with you and another person to agree with you and before you know it we’re all rhinoceroses. At this point, making Yiddish theater in 2017 in New York there’s obviously a grandfather, father, and son and even grandson. But despite these historical precedents, there is still a void. How do you feel about the tradition of Yiddish theater given the huge gap? Do you think there’s any freedom to creating in a void, to being your own “grandfather, father and son?” Do you feel there’s a precedent from Hasidic life that lends itself at all to Yiddish theater, Yiddish performance, and Yiddish translation? I think so much of this is informed by and emblematic of that Hasidic spirit. That creative, Hasidic spirit that radically departs from—even though it exists on the backdrop of—a body of traditional religious thought and philosophy and ideology. And it [the Hasidic movement] used all those [traditional] tools while still radically departing from the past. I think we’re experiencing that kind of—I hate the term renaissance—but that kind of radical shift from the past right now. That’s what’s so damn exciting about making Yiddish theater right now. Part of it is also because we have such a diverse wealth of resources to draw from. You have the background of twentieth-century American theater, which is there for better or for worse. Yiddish theater, experimental theater, all these different genres and we’re kind of trying to combine all of that into one world. It’s not so much a void as it is the fact that we get to start over fresh. It’s kind of the best of both worlds, really. Because when they did it a hundred years ago they didn’t have a body of literature to pull from; they had to create everything from scratch. We have the benefit of that vast body of art that’s already been created and we get to reinterpret it in the way we want to. So we’re both the Zaidy and the blank slate, and the grandchild, so I think it’s really the best of both worlds. Recognizing that we’re situated very similarly [to our historical precedents]. We too are experiencing an enlightenment of sorts that they experienced then. You mean leaving a Hasidic community? Leaving a Hasidic community, leaving an ideologically oppressive environment, leaving the mental ghettos, in much the same that they did. And also kind of in a similarly politically turbulent time as they did. A lot of the stars are aligned, a lot of the circumstances are similar but different; for example, in those days the majority of Yiddish speakers were not religious. 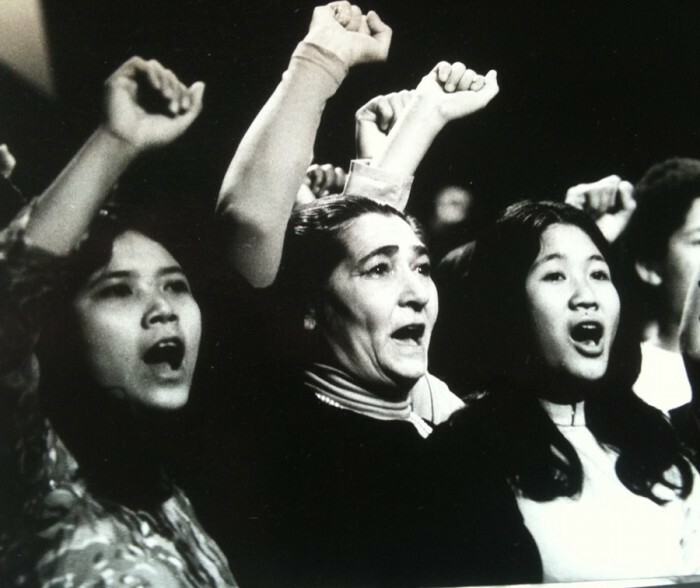 In these days the majority of Yiddish speakers are. In those days the existential threat to Yiddishkeit was a physical one, today the existential threat to Yiddishkeit is a spiritual one or an ideological one or a cultural one. So it’s almost as if everything is flipped. And we [at the New Yiddish Rep] have the benefit of drawing from the different experience of actors: we have non-Jewish actors, we have Jewish actors who grew up non-affiliated and we have Jewish actors who grew up in very religious and Hasidic environments. And they all kind of inform each other. So it’s an exciting time for Yiddish theater. Benjamin, Tova. 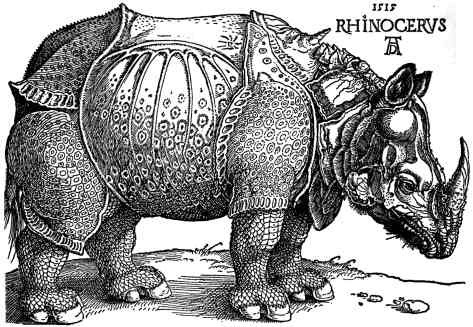 “Remedy Before the Sickness: Eli Rosen on Translating Rhinoceros into Yiddish.” In geveb, September 2017: https://ingeveb.org/blog/remedy-before-the-sickness. Benjamin, Tova. “Remedy Before the Sickness: Eli Rosen on Translating Rhinoceros into Yiddish.” In geveb (September 2017): Accessed Apr 20, 2019. Tova Benjamin is a PhD student in the Skirball Department of Hebrew and Judaic Studies at New York University. Just in time for the new spring run, a review of the New Yiddish Rep’s production of Sholem Asch’s (in)famous play.